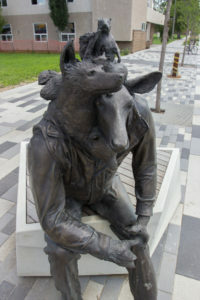 Wild Life consists of two bronze figures appearing to be citizens leisurely going about their day. However, upon inspection, the figures reveal themselves to be composed of squirrels, raccoons, foxes, owls, and other animals working together to appear human. Humorously referencing cartoon clichés, this sculpture invites a thoughtful reflection on our relationship to nature. Wild Life challenges viewers’ perceptions by making a seemingly mundane scene extraordinary; your average loiterer in jeans and a hoodie morphs into a conglomeration of animals that while shocking and intriguing, reveals the extraordinary possibilities beneath the mundane that we take for granted.